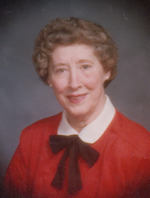 Dorothy Rhodes Stewart, age 94, of Antioch, Ohio died Thursday September 1, 2011 at the Wetzel County Hospital. She was born in Cadiz, Ohio September 15, 1916 a daughter of the late John W. & Alice M. Calentine Patterson. She was a school bus driver for River Local, and a 22 year employee of LGAM where she served as Union Chairlady for many years. She was a member of St. Paul’s Church Trail Run. Dorothy loved and was dedicated to her church and church family. Preceded in death by her sons; Ronald Dean Davies, and David Lee Davies, her husbands; David Davies, Oris Rhodes and Howard Stewart, eight brothers and sisters, and one grandson; Zane Pollock. Dorothy is survived by her daughter and son-in-law; Janice & John Pollock of Jacobsburg, Ohio, and her grandson; Patrick Pollock. Memorial Service will be held 2 p.m. Saturday September 10, 2011 at St. Paul’s Church Trail Run with Rev. Albert Bingenheimer officiating. Inurnment in the Antioch cemetery. Arrangements by Bauer-Turner Funeral Home Woodsfield, Ohio.